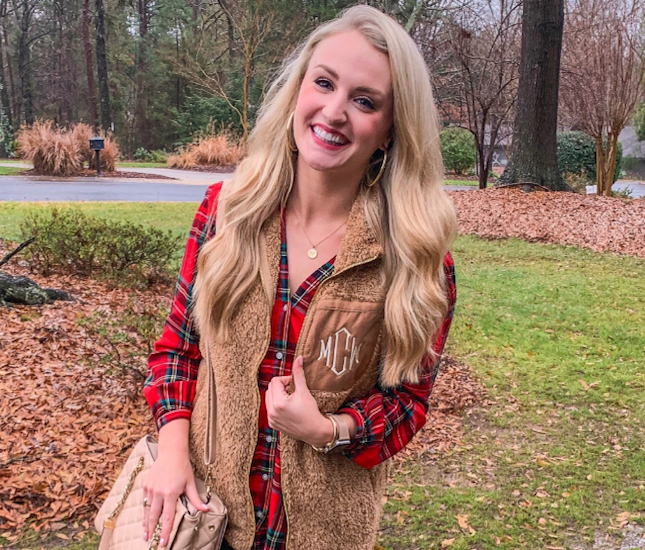 My boyfriend gave me this monogrammed sherpa vest from Marley Lilly for Christmas and I have been wearing it non-stop! I got a medium so that I would be able to layer flannels, blouses, and lightweight sweaters underneath it. It feels like you’re walking around with a little blanket around you! Seriously soooo cozy and warm. It’s perfect to wear with jeans and booties OR can easily be worn as an athleisure look with leggings and tennies. I love how versatile it is and am obsessed with the camel color! I first wore my sherpa vest to a casual family Christmas get-together last month and it was perfect! It’s a great layer to add when it’s not “cold,” but just a little chilly. That’s been so typical of the weather in the Carolinas recently! On top of the sherpa vest, Marley Lilly has so many cute and cozy pieces in right now! They’re always my go-to when I need to get some everyday monogrammed pieces. You can get this style in a sherpa tunic version, or a zip up jacket version as well (I know this one would be SO warm!) I also love the monogrammed sherpa blanket and personalized slippers. To be honest, if I could just walk around in a full sherpa bodysuit all day every day, I would! I’m totally over the cold and ready for spring! For even more Marley Lilly content, check out my recent post on their everyday tote that I use for my work bag!